Joomla! 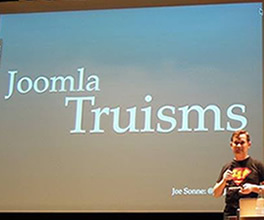 Truisms are valuable things related Joomla! that I have found to be true. Some of these I learned from others along the way and a few I picked up from the school of hard knocks. Learning from experience is not aways pleasant especially when the thing you are trying to solve is urgent and evasive. I'm not certain how many of my hours were spent searching for the answers to some of these problems but it was significant. Generally truisms are not widely known but they should be. Learn about them and they will keep you anchored and from drifting into problems later. Let's look at a couple of Joomla! Truisms starting with probably the most important one - backups. Just because you did a backup doesn't mean you have a backup. This one can be a killer. Everyone knows you are suppose to do backups. If you aren't doing backups of your websites you are not being a responsible website owner or maintainer. The truth about backups is much more than installing a component, configuring it to do automated backups, and then forgetting about it. If you do a backup and it's not restorable, meaning when you retrieve the data to restore the site on a server, and it doesn't work, then you don't have a backup. Unless your backup is restorable it's not a backup, it's a useless file. What if you do a backup which is restorable but it was saved on the same web server that your website was on and there is a problem with the server? You still don't have a backup. You don't have a backup unless it's retrievable and restorable. The best strategy is to save the backup file on a different server. A great choice is to use Amazon S3 servers for your backups. A component such as Akeeba Backup Pro can be configured to upload your backups to a remote server like Amazon. This isn't foolproof though, you have to test your backups to make sure they will restore. Recently I discovered my backups for a particular site on Amazon S3 servers were not restorable. The sad thing about this is that you are paying for storing useless files on Amazon when they are no good. Another Truism is to use non SEF (search engine friendly) URLs for links within your site. How many of us have been using the SEF URL for links in articles and custom HTML modules? It's easy right? All you have to do is copy the URL from the browser of the page you wish to link to and just paste it into the link field in your article manager. Well that's the wrong way to do it. and one day someone decides to change the title of the article, or change the menu that is used for the article, then the link will break. If we use the non SEF (ugly) URL the link will always work because it is the Joomla! assigned URL in the database for the specific item. 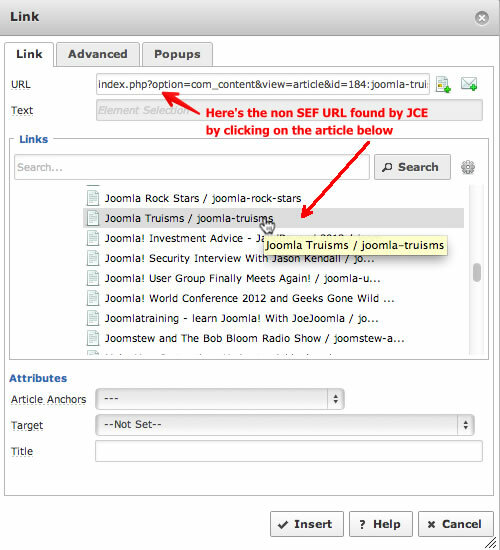 The easiest way to create the non SEF link to an article in Joomla is to use the Advanced Link Component in JCE, the advanced text editor for Joomla. With this component you can browse to the menu item or content item you want to link to. When you click on the article you want the link for, JCE will put the non SEF URL as the link. This very easy to use. I hope you enjoyed these "Truisms". That's it for this post. I'll do some more in the future.